Clean your decanters with these ingenuous stainless steel beads. All you do is add water and gently swirl. The high-grade steel pellets smoothly roll over and gobble up stains and deposits. Even hard to reach places will sparkle. Rinse and re-use over and over again. Re-use again and again. Clean your decanters with these ingenuous stainless steel beads. All you do is add water and gently swirl. 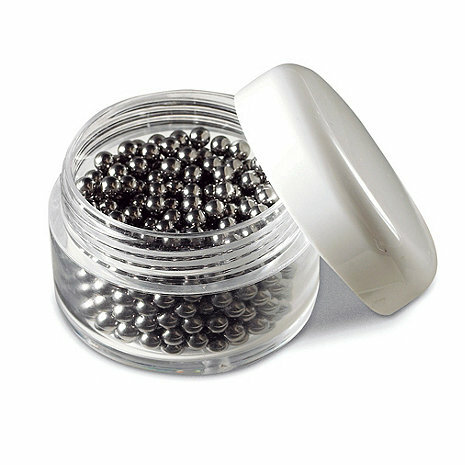 The high-grade steel pellets smoothly roll over and gobble up stains and deposits. Even hard to reach places will sparkle. Rinse and re-use over and over again. What is the diameter of the beads? BEST ANSWER: The diameter of the cleaning beads is very small somewhere in the ballpark of 4mm. Can these be used if the interior of a vintage decanter is not smooth? Would the bouncing of them damage it? Would any other stainless steel beads work as well, or is there something special about these? BEST ANSWER: Hello and thank you for your question. The size and shape of these beads were designed specifically for the use of cleaning decanters, especially in those hard to reach places. This has been one of our more highly reviewed products for several years. Please view our video for a demonstration by our Wine Director. I bought these for myself with a new wine decanter that I received as a gift. My dad had an older decanter that had this really big stain on the side so I decided to put this product to the test. It took a little bit of time to sit there and swirl the beads around (about 15 minutes but this was a big, old stain so I am impressed) but the stain came out and the decanter looks like new. There are some reviews complaining about the size of the container versus the picture and while that is true that does not really have any bearing on how effective the product is just don't be expecting a huge case. It is about the size of a quarter around and maybe an inch thick. It can be tricky to get the beads out without losing them but I find that folding a paper towel and holding it over the top and pouring the water through while catching the beads works best. I would recommend this product to anyone who wants a clean decanter and does not mind a little bit of challenge to keep from losing the beads. With patience, these beads removed years of build-up from an old and well-loved decanter. After use, pour water and beads out throgh a sieve to prevent loss. I make wine a home. Friends save bottles for me, but sometime they store them in the garage unrinsed. I used these beads to clean dried wine from the inside of some bottles. They worked great and easier than using a brush. The only problem is that if you spill these beads they roll everywhere. Perhaps the stains on my decanter are too tough to tackle in one or two applications, but these beads, while removing some of the stains, still left some behind. Cleaning with the decanter sponge after using the beads helped a bit, and I have confidence that the beads will eventually work to remove all stains from the decanter. Perhaps it'll take a few more tries. I have to admit I was skeptical at first but my decanter had seen better days- it was full of red wine deposits and I had tried everything to get it clean. I ordered the beads, used them, and my decanter looks brand new! The first use did take 15 mins or so but now the subsequent uses only take a couple minutes. If you have a hard to clean decanter this is the product for you! Completely cleaned the 'scaling' left in our red wine decanter -- we had been using the decanter for about a year with no ability to scrub the bottom - these beads did the trick! It took me two tries to get the decanter completely clean, but now it looks brand new. Very glad I made the purchase! When I'm done cleaning, I simply empty the beads from the decanter into a fine mesh sive, rinse with water, and allow them to air dry. a funnel or a very steady hand will get all the beads back into their container! When I first bought the beads I thought they were a novelty that I'd never use. Well I use them every time I decant a bottle or 2. Seriously, if you own the amadeo lyra decanter you have to have these - they are the only way to clean out the bottom. Actually they would be great with any decanter. So buy the beads, $ well spent, you will use them. These cleaning beads are small but they pack a big punch. I immediately opened the container and poured the beads into my decanter, added a little water, swirled and watch the decanter start to sparkle. Thank you to the previous poster with the idea of pouring the beads onto a paper towel, drying them and using the paper towel to funnel the beads back into their container, worked like a charm. We have a 25 year old crystal decanter that was quite stained by red wine on the inside. These beads really helped clean it up. Recommend using a screened strainer to catch the beads when you are done. Handling the cleaning beads so as not to spill any, especially when retrieving them from the decanter, can be tricky. Like the cleaning brush, the beads seem to be useful, but are not the complete cleaning solution -- the bottom of my decanter does not sparkle light the rest of it. I'm a sommelier in a fine dining restaurant. I used the beads on a several capatain's decanters with light to moderate stains. The beads removed a little of the stain, but certainly not enough to warrant the [$]. I later used baking soda, a little white vinegar, and some rice, and the decanters came out crystal clear. It also leaves no aroma in the decanter has some of posted concerns about. not satisfied- really does not clean decanters as advertised. Let the base of decanter soak a while with warm soapy water then use beads. very effective. Use strainer to pour water and beads into so don't go down drain or on the floor. these work as advertised.. they clean the inside of the decanter ... which is an annoying task. We typically keep a wine 3-10 days in a decanter and you can get that ring at the top level of the wine. these work about as well as a brush, but they are easier to use. it is a little tricky getting them back in the storage jar but that is a minor complaint. The beads work fine. Just as described in the advertisment. This product is very effective for cleaning a wine decanter. The perfect tool for cleaning every type of decanter. It is quick, easy, and very effective. You don't need anything else. Although pricey these metal beads worked as promised! This product is worth every penny! It is especially effective in cleansing decanters of unusual shape. Reusable. These beads clean so effectively. They're amazing. Such an improvement over the grains of sand I used to use to swish around in my decanters & vases. I have used this for other household items such as glass vases and other glasss containers. Had a badly stained decanter, these absolutely did the trick! It's a little challenging to get them back in the storage container but well worth the effort! This is without a doubt and absolute necessity for anyone who serves wines in decanters, or any drinks in pitchers. Just like the video explained, it works without any strain and solves the problem of cleaning hard-to-reach areas. I think these beads are a fabulous find. I'm using them to clean my glass bottles I use for my drinking water and raw milk. The necks of both sizes of bottles are too narrow for any brush, and putting them in the dishwasher doesn't get them clean. The beads get the inside of the glass bottles as clean as if they were brand new. I looked everywhere and tried everything I could find. These decanter cleaning beads are perfect! Yes, they are very small and extra diligence is needed to ensure their safety, but the effort is totally worth it. Soak the decantur in water overnight. Remove almost all the water, add the beads, plug the opening with a towel, and shake the decantur very hard for at lest several minutes. My opinion is that you must be a physical person to use this product effectively. Fantastic with the Eve Riedel Decanter!! Easy to re-use over and over again! A great product, the only ncon is that the balls are very small and easely lost. I'm impressed with how well they worked, in one try. They are unruly little things and you have to be careful that they don't escape down the disposal. I drained them into a sieve to dry. Had some red wine stains on the bottom of a decanter that I couldn't reach with a brush. I used the beads with water and got 80% of the staining off. I had to desert to a little Bon Ami to get the remaining stain off, but it worked! for any bottle, really, everyone should have a set. Remembering where you put them could be tricky, however. Much easier than using a bottle cleaner... Be sure to have small colander/ screen near by when you empty them out of the decanter. Also great to clean vases. Even my old crystal decanter came clean with these tiny steel balls. What a great idea! I was skeptical about these beads, but they really clean my decanter very well. I've used about every type of brush made and never could get the red stain out of the bottom of a duck style decanter. First time I used the beads, most of the stain was gone. After the second use, the stain was gone completely. These work great. The only drawback is that they are small beads. Be careful handling them or you will be picking up beads from all over. They work quite well for getting decanter clean. They are very small and you have to be careful or they will wind up all over your kitchen floor when you are trying to put them back in their storage container. Great Product! Gets into the corners of your decanters that brushes cannot. Seems to clean well. I used a funnel with a strainer to retrieve the product when done. They ARE small, so be carefull you dont loose them (like down your sink). You have to be careful not to lose the little beads but it worked in an odd shaped decanter that I was ready to throw away. There was a lot of old residue but it was much faster the second time I used it. These worked very well for cleaning the humidier portion of a sleep machine. The design of the humidier makes it very difficult to clean. These make it much easier to clean. The only problem is getting them back into their container. The Decanter cleaning beads worked extremely well. They did the job quickly and effectively with easy clean up.